We arrived at Hilo airport at the south end of the island, picked up our hire car and drove approx. 30 miles to Hawaii Volcanoes National Park. It was an easy ride through residential suburbs and pleasant forest; the road climbed gently but there was nothing to suggest that we were driving up a live, and very active volcano. We arrived at the National Park entrance, stopped at the visitor information centre to pick up some maps and talked to a park ranger to find out how they suggested we use our time in the park. Opposite the visitor centre we saw the entrance to the Volcano House Hotel, it looked similar to other park lodges we have stayed in, nothing fancy and all about the park location. We left our bags in the car while we checked in, and then went to find the bar to get some lunch. Wow, that was when we saw the view!! Looking out of the panoramic window in the bar we looked straight out onto the crater of Kilauea, and right in the middle, in a smaller crater we could see smoke rising in a cloud into the air. The bar staff told us that we had picked the perfect time to visit, the summer crowds had left (Monday was Labour Day, traditionally the last day of the summer holidays, time to go back to work and school) and the Volcano was ‘doing all kind of crazy things’. 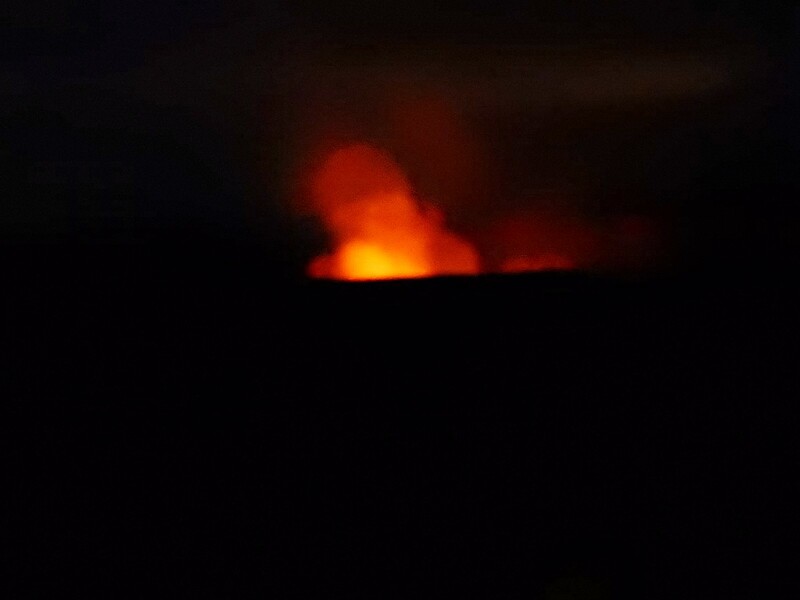 Although we couldn’t see it from the hotel the lava field bubbling under the surface of the Halemaumau crater (the smaller one) had risen high enough to become visible, this hasn’t happened for 18 months, and before that seven years ago. We had a quick lunch and then drove around Crater Rim Road to the Jagger Museum which has a crater viewing terrace, from there we could see the red hot lava bubbling and spitting. Along Crater Rim Road we drove passed hot steam vents in the ground and could see patches of vegetation which had be completely killed by hot steam bursting through. Amazing. 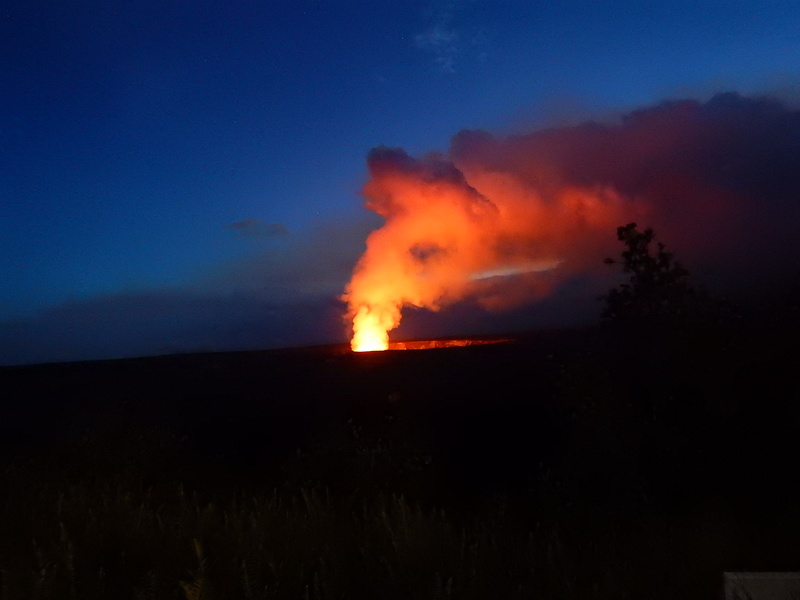 Sunset in Hawaii is about 18.30, we sat in the lounge looking over the crater, as the sky got dark the cloud of steam took on a red glow until, once the sun had disappeared we could see the red flare from the lava sending a plume into the sky. Even in the restaurant we couldn’t take our eyes from it, and it took us a while to draw the curtains in our room which looked straight across the crater. Saturday morning we got up, had breakfast and set off into the park, the weather was hot so instead of doing a long hike we decided to do three shorter walks visiting some of the park highlights. First we went to the Thurston Lava Tube, an underground tunnel formed 500 years ago by a stream of lava, it wasn’t very long, maybe 500 meters but we had the whole place to ourselves which was very atmospheric. At the far end we emerged into an area of rainforest and followed the path back to the car park. Next we decided to walk ‘Devastation Trail’, a path led from the carpark into woodland, very lush and colourful with lots of birds; after about 10 minutes we rounded a bend and found ourselves on the moon! We had emerged at the back of the Kilauea Iki volcano cone. The last major eruption of Kilauea was in 1959, it lasted for two months spraying a fountain of lava up to 1900 feet in the air, as it fell back to earth it covered the surrounding area in cinder debris. The wind blew some of it behind the crater creating a huge domed hill, the trail took us around the base of this hill to a crater overlook. Even now hardly anything grows on the cinder landscape. After 2 nights our time by the volcano was over, it was time to drive up to the north west coast and to check into the Mauna Kea Beach hotel. The drive was great, a good road, lovely weather and very little traffic. 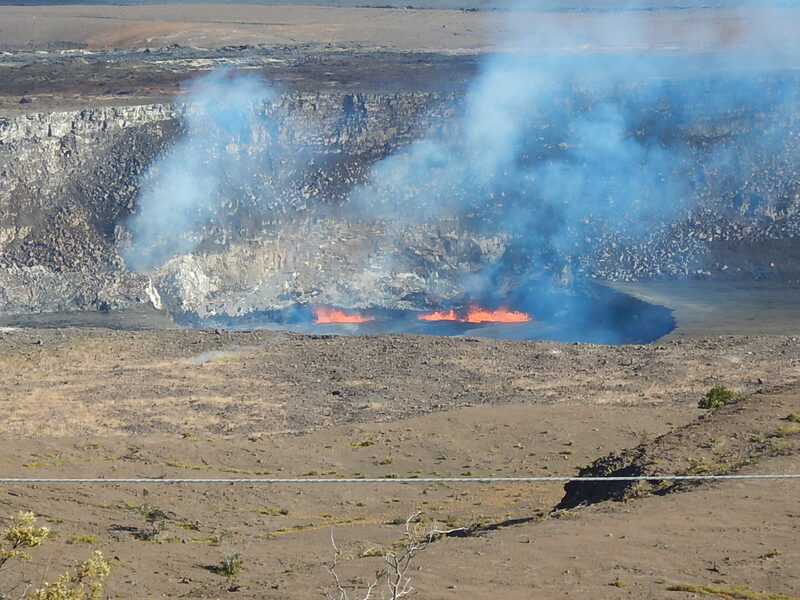 We drove through the rest of the Hawaii Volcanoes National Park and around the base of the next volcano Mauna Loa. On the way we drove through the Kona coffee growing region; we stopped at a coffee plantation for a tour of the orchard and the drying process. We also got to taste a range of coffee from the plantation and discovered how adjusting the roasting process alters the flavour. We also saw some huge Macadamia nut farms. As we approached our next stop we drove across lava fields which stretched down the slopes of Mauna Loa to the sea. The road cut through great stretches of lava some of which were like clinker from a fire place, sharp and brittle gravel; others formed from sheets of lava which has set in to smooth waves covering everything in sight. Nothing grows on the lava fields and nothing is built on them, it is a vast wasteland bordered on one side by the greener mountain slopes and on the other by the blue of the Pacific Ocean. We reached the entrance to the Mauna Kea Beach Hotel and turned in to a drive winding across the golf course, an oasis of green with beautiful trees and shrubs – I can’t comment on the sustainability of the grounds but they made a wonderful contrast to the lava fields! The hotel was lovely, calm, cool and stylish with a fantastic beach and a simple beachside restaurant (there were a couple of smart restaurants too but we liked the one by the beach). Our room wasn’t ready so we had lunch and waited to collect out key. When we did get to our room we had been upgraded to a deluxe ocean view room, we had booked an ordinary ocean view room which I’m sure would have been very nice. The deluxe room was lovely, it had a large entrance lobby, a walk in wardrobe/dressing room, a vanity room with two sinks and a huge bathroom with a feature bath, a wet room style shower and its own balcony. The bedroom had French windows right across one wall opening onto a second balcony overlooking the beach and out to sea. We would have been very happy to spend our three days just enjoying the hotel but our itinerary had other ideas. After a morning swimming from the beach and enjoying our balcony we drove to a local shopping centre to rendezvous with a tour to the summit of Mauna Kea. Mauna Kea is the highest peak in Hawaii (14,000ft) and is the site of one of the most important observatories in the world, there are thirteen large telescopes at the summit taking advantage of clear skies and virtually non-existent light pollution to look deep into space. Our tour took us right to the summit, pausing part way up for a picnic which also gave us time to adjust to the altitude. We also stopped to see a large telescope dish which works with telescopes across America to form a huge array. We reached the summit in time to watch the sunset, it was a bit cloudy with layers of cloud above us and below us in the valley, as a consequence we watched the upper clouds light up bright orange as the sun sank behind the clouds below out feet – beautiful. It had been 34⁰C when we left the hotel, at the top of the volcano it was 0⁰C so we didn’t hang around too long. We stopped for hot chocolate on the way down and also had a chance to look at Mars, Saturn and the moon through a telescope when the cloud cleared at the foot of the mountain. It would have been great to have seen the night sky at the summit but the weather wasn’t with us. We had another lazy day at the hotel swimming and relaxing on the balcony before heading out for our second excursion – night snorkelling with Manta Rays! A small boat took about 20 of us out to a rocky point where currents converge and plankton accumulates. We joined a small group of boats that had anchored there, donned our wet suits and got into the water. Everybody from our boat took a place holding on to a ladder shaped float which was fitted with downlights. 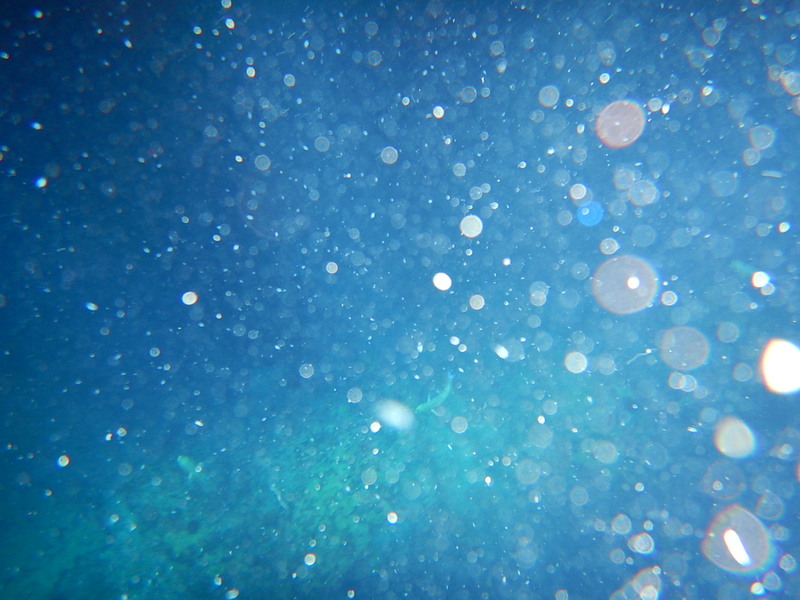 As we floated over the seabed the lights attracted plankton and in due course the plankton attracted the Manta Rays. They were huge, 7ft across with huge mouths that swallow water and filter out the plankton they feed on. They would swim along the seabed then loop up to the surface on their backs right underneath us. We had been told not to touch the rays because it can damage their skin but at times they swam so close to us they would brush against us. We were in the water for about an hour and it was a really magical experience. All to soon our time at Mauna Kea Beach was over and we drove to the local airport for our flight to Honolulu. Our hotel in Honolulu on the island of Oahu is on Waikiki Beach, we have only had a day here but from what we have seen of Waikiki that is probably enough! It is very over developed, very touristy and at street level seems to consist entirely of the service entrances and carpark of huge resort hotels. Apparently the rest of the island is very pretty but we will have to take that on trust. 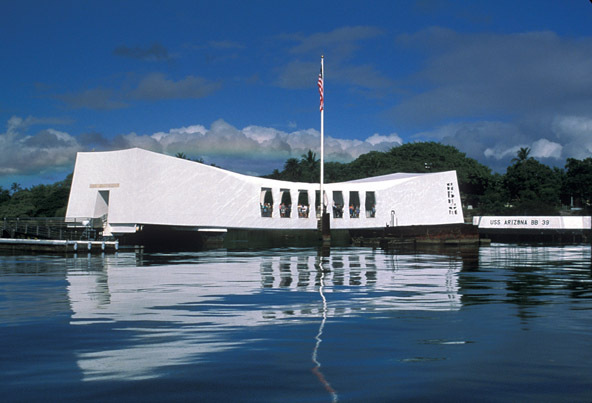 We spent our one day here visiting Pearl Harbour which was very interesting. It was an early start, we were picked up at a local hotel at 6.40am, but it was worth it, we saw several sites that were attacked by Japanese planes in December 1941 causing America to join WW2. We were by taken by naval boat to the Battleship Arizona memorial built over the wreck of the Arizona which was sunk in the harbour with the loss of 1100 lives. We toured an attack submarine, the Bowfin. We went to the Pacific Aviation Museum which is housed on one of the airfields attacked in ‘41. Finally, we went aboard the battleship Missouri and saw the deck where General MacArthur and representatives of the Allied Forces received the Japanese surrender bringing WW2 to an end. It was interesting to spend time exploring the crew quarters on the Missouri and seeing how hundreds of sailors live together in close quarters on a battleship. That’s it, our time in Hawaii has come to an end, tonight we leave for Samoa and begin our trip through the South Pacific. Our flight leaves at 01.05 on Friday morning, it is a 6.5-hour flight and we arrive in Upolu at 06.35 on Saturday morning so we are leap frogging you guys in England as we cross the international date line. See you on the other side!